Is Safe Scootering an Oxymoron? A kick scooter is a human-powered land vehicle with a handlebar, deck and wheels, and propelled by a rider pushing off the ground. They are made of aluminum, titanium and steel. Scooters are cool with names like Powerslide Coolmax, Envy, and Razorback Graffiti. There are two different types of scooters, three wheelers, which are more balanced and safer, like a tricycle, and two wheelers. Pro scooters are designed for extreme sport stunts and tricks and made to withstand stunt stresses. Can scootering be safe for kids and the growing number of big kids enjoying the sport and using scooters for transportation? Check the brakes before each ride. Check that supporting screws are tight. Check handlebars and steering column. Wear protective gear, including helmet, shin guards, knee, wrist and elbow pads, and gloves. Wear long pants, long-sleeved shirts and closed-toe shoes. Ride on smooth, paved surfaces without motor vehicles. Avoid streets or surfaces with water, sand, gravel, or dirt. Do not ride at night. The American Association of Orthopaedic Surgeons urges parents to only allow young children to scooter if he or she demonstrates the balance, strength, coordination, and judgment to safely operate a scooter. Parents need to check the height and weight restrictions of the scooter to be sure that it is appropriate for the child and teach the child how to ride, steer and brake properly, supervising practice sessions. DOC promotes safe scootering practices. 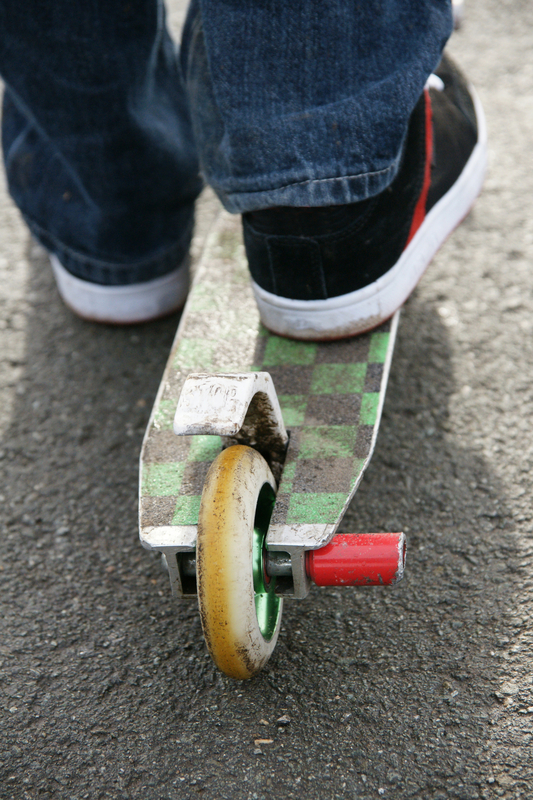 However if a scootering accident occurs while performing a boost, flow or flyout, the orthopedic surgeons and specialty-trained PAs at DOC are dialed to treat any musculoskeletal injury seven days a week.